The future of marketing (and business) is solving customer problems succinctly and effectively. (tweet this) Actually, that’s always been the point of marketing and business, but evolutions in commerce thinking and consumer technology have made solving problems easier and smarter than ever. This, of course, is the whole point of Youtility, my new book about truly helpful marketing. In Youtility, I talk about my favorite mobile app Run Pee, which tells you when it’s okay to get up and go at the movies. Solves a problem, and solves it perfectly. But now, Run Pee has its first true competition for my personal #1 spot. It’s called the GameGuy app. The GameGuy app solves an even more specific problem, and solves it with such seamless ease-of-use it’s the ultimate “why didn’t I think of that?” head slapper. 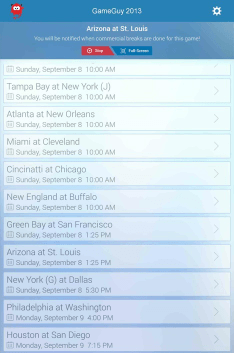 The GameGuy app (iOS and Android) will work for every NFL game this season. Just set which game you’re watching, and the app will alert you when the commercials have ended, and the action has returned on the game you’re watching. Never miss another key play due to a microwave burrito, line for the bathroom, or chatty pal. It’s so well thought out it even has a “party mode” when it’s too hard to hear the app. Just set your phone or tablet near the screen, and it will change color when commercials are over. Amazing! I also love the funny demo video for the app (embedded above), the witty-yet-informative FAQ, as well as the wise “we’ll hook ya” pricing model. The app is free for the first quarter of any game, and is then $4.99 for the entire season thereafter. The app was created (and launched just 3 days ago) by Michael Donnelly, a brilliant developer who worked with some of the Convince & Convert team members a few years ago at Sitewire, a digital marketing agency in Arizona. Mike describes the app as “like a little man that taps you on the shoulder and reminds you the game is back.” The impetus for GameGuy is a story that any legit NFL fan will recognize….Mike (like me) is an Arizona Cardinals fan, and was watching the game at a friend’s house. During a timeout, they switched the channel to the Steelers game because the friend is a Pittsburgh supporter. (as Mike says, “why I’m friends with a Steelers fan is a whole different issue”). By the time they switched the game back to the hometown Cards, Patrick Peterson (the Cardinals do-everything return man, cornerback and part-time wide receiver) had returned a punt 80 yards for a touchdown. Note: On the off chance you are not a football fan, but have read this much of the blog post, a punt return for a touchdown is the most exciting play in football. It’s akin to a triple in baseball. Although that analogy may not have helped you in the slightest, I’ll acknowledge. That kind of anger and frustration is a petri dish for inspiration. Mike was working on kidney dialysis software until his “we need an app to tell us when the commercials are over” moment. Setting aside the vastly more important, but extraordinarily less interesting dialysis project, Mike built the whole GameGuy shebang himself, including the iOS app, the Android app, the website, the marketing. The plan is to apply the GameGuy technology to other sports, eventually. According to Mike, anyone who has EVER watched the last 5 minutes of game time of a close NBA game can see the benefit of GameGuy for hoops. But with approximately 50 million NFL fans owning smartphones, he’s got a lot of room to provide Youtility within his core audience. Thanks Mike Donnelly! Neither nachos nor beer; nor restroom nor telephone will prevent me from missing a play this season. Get more GameGuy info on the website, or find it in your app store. Tell Mike what sport you’d like to see next in the comments, won’t you?